Ten weeks ago I wrote of the “pot in pot” propagator that I was using to root dormant fig and mulberry cuttings. The propagator is nothing more than a small, porous, clay pot filled with water and with its drainage hole plugged that I plunged into the mix of peat moss and perlite that filled the larger pot. Water drawn out of the small pot keeps the peat-perlite rooting mix consistently moist. The cuttings have sprouted with enthusiasm. And when I lift out the small pot, I see roots running around in the moist rooting mix, so I separated the plants and potted them up individually. No need to put the propagator away now that plants are no longer dormant. 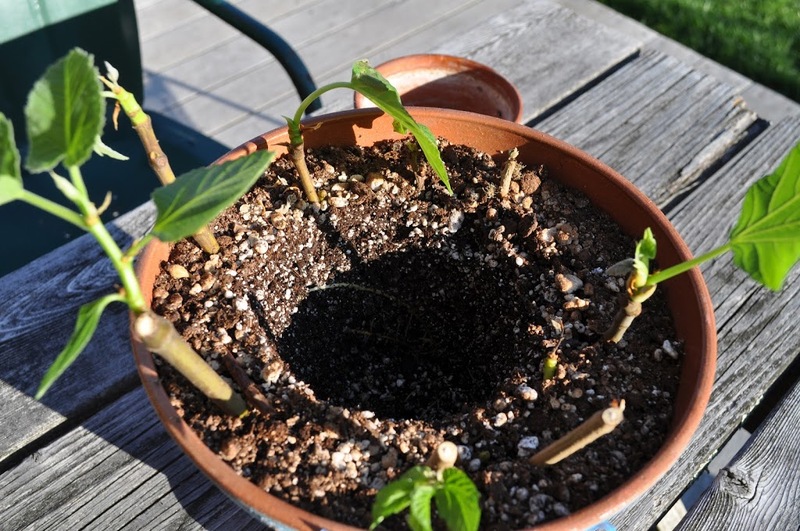 With a simple covering to maintain humidity, the propagator also works well for so-called softwood cuttings, that is, cuttings that start out with leafy shoots. Technically, today’s new cuttings aren’t “softwood” because they haven’t had time yet to begin much growth. They could more accurately be called “leafy.” Their first leaves have unfolded and shoots (the “softwood”) are soon to appear. Whether “leafy” or “softwood,” such cuttings need high humidity to keep leaves from wilting until roots develop. 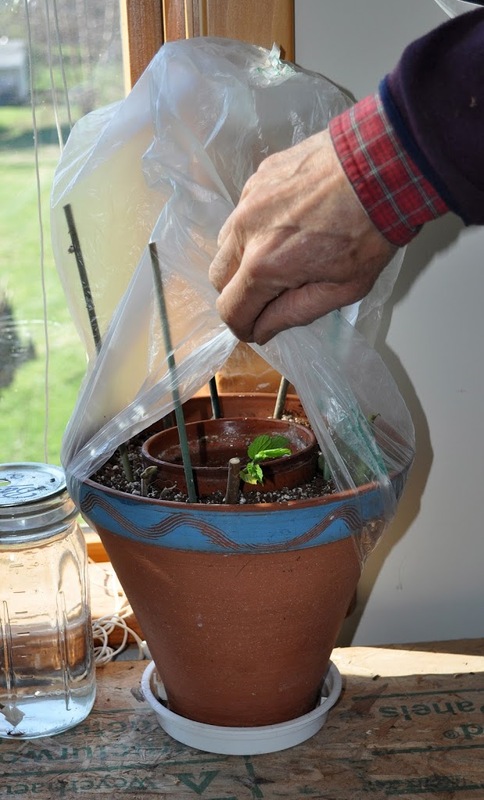 The propagator conversion involves nothing more than poking four sticks into the rooting medium equally spaced around its outer edge, and then draping a plastic bag over the sticks. Bright light will keep the green leaves feeding the cuttings. Direct light is a no-no because it would cook the cuttings in their high humidity chamber. I suppose I could be nostalgic about the quackgrass (Elytrigia repens, and also commonly called witchgrass and couchgrass) stealthily making inroads into my various gardens. After all, quackgrass was my first serious weed problem in my first real garden, a vegetable plot of about 500 square feet in Madison, Wisconsin. At the time, the lakes in Madison were suffering their own weed problems, the result of “fertilization” of the water with runoff from over-fertilized, residential lawns surrounding the lakes. Giant beaters plied the lakes in those days, chopping the lake weeds which were then harvested onto boats and then trucks for disposal. “Weed-free mulch!,” thought I.
I convinced a lake weed crew to dump a truckload of those water weeds onto my front lawn. I spread the mulch quickly — I had to because the soggy mass started rotting within a few hours to what was beginning to smell like a a pig farm. Laying pitchfork after pitchfork of the stuff between rows of vegetables spelled quick death to the quackgrass. My gardens now are far more extensive, no straight expanses beckon easy mulching, and water weeds are not in the offing. 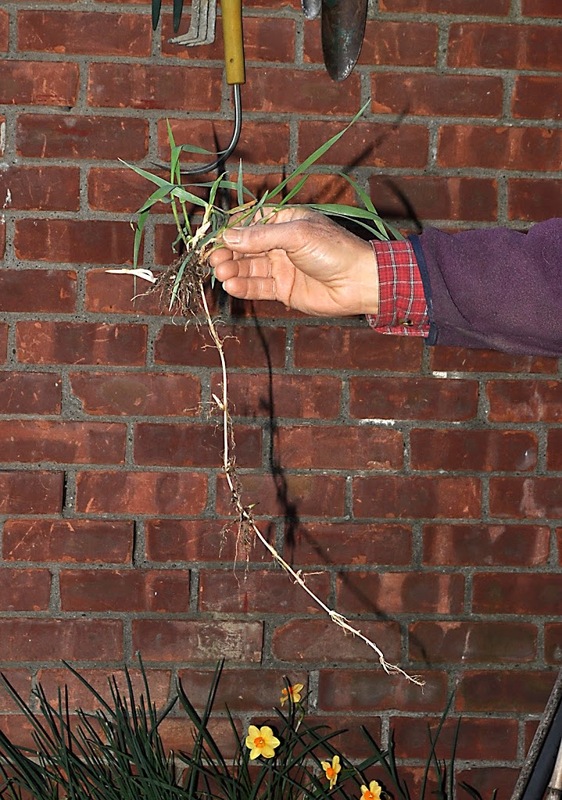 So for now, I am attacking quackgrass mano a mano, digging and pulling out every last shoot that I can find along with attached, running roots — no easy task among perennial flowers. Where I can, I’ll spread a few sheets of newspaper and top that with mulch. Now is the time to attack because in about a month, new runners will begin to push further afield just beneath the soil surface. The pointed ends of these runners are sharp enough to push right through a potato. Quackgrass is so widespread that you’d think it was native. Not so. But it has been here for a long time, coming over from Europe with the first colonists. And it’s not all bad: It is good forage for horses and cows, and has been used in herbal medicine especially for kidney ailments. “It openeth the stoppings of the liver,” according to 16th century herbalist John Gerard. Still, it’s not welcome in my garden. I’ve got one more deathly arrow in my quiver with which to fight off quackgrass, but it must wait until the weather warms. Vinegar. Household strength vinegar sprayed on the plants kills the leaves; repeatedly killing the leaves eventually kills the plants. I boost vinegar’s efficacy by pouring 1 tablespoon of Ivory dish detergent and 2 tablespoons of canola oil into each gallon of vinegar. Vinegar works best when temperatures rise above 70° F.
This entry was posted in Uncategorized and tagged cuttings, Elytrigia repens, herbicide, pot in pot propagator, quackgrass, vinegar. Bookmark the permalink. Trackbacks are closed, but you can post a comment.